Vancouver Whitecaps game on Saturday was played in farcical conditions. Now let’s get this straight off the bat. The snow wasn’t the main reason for the ‘Caps capitulation. It was a terrible team performance, with a defence all at (frozen) sea, no midfield creativity, and a strikeforce left with no service whatsoever. The new look 3-5-2 formation failed miserably and RSL could have been about five goals up by half time if Joao Plata and Yura Movsisyan had their shooting boots on. And that was all before the pitch became under inches of snow and the ball wasn’t moving freely. The conditions were unplayable in that second, but they were the same for both teams, and my feeling about whether the game should have finished would be exactly the same if the ‘Caps had somehow come away from the match with all three points. The massive issue for me is that the game was allowed to go the full 90 minutes in those conditions. It ruined a football match, wasn’t fair on the fans who admirably braved the weather to the end, and put the players safety at risk. It was ridiculous that the match went the full 90 minutes. The second half simply shouldn’t have started. In the UK, a game like that, in those conditions, wouldn’t have finished. If the ball isn’t running, which it wasn’t, then the game is called off. I know that from first hand experience of being in a stadium when that happened, and ‘Caps coach Carl Robinson agrees. “No it wouldn’t [have finished there],” Robinson told AFTN when we spoke with him at training on Tuesday. “I spoke to referee [Baldomero] Toledo afterwards and we both agreed that maybe it shouldn’t have finished. But it was the same for both teams. The difference between how the match started and how it ended was staggering. So if both the referee and one of the coaches both agree the match shouldn’t have finished, the burning question then is why wasn’t it abandoned? MLS rules are in place for postponements and abandoned games. If the game was called at half time, the teams would have played the second half (not the full game) the next available day. With the game tied at 0-0, that would have made complete sense. It also might have given the ‘Caps extra time to discuss how to play a 3-5-2 or review the tape and make half time subs for the 4-4-2. But you never felt that was going to happen, and then once RSL opened the scoring, all hope of common sense prevailing had gone. Of course MLS has previous history of letting their games go on in farcical conditions. We saw it earlier this season with Minnesota’s ridiculous home opener against Atlanta. I’m pretty sure the occasion, the TV companies, and the money made sure that game went ahead and the fact that it did held out little hope that the ‘Caps game would get called. 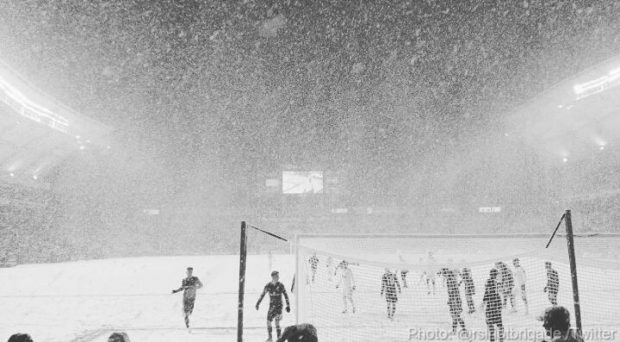 In fact, RSL v Vancouver was the TENTH snowy game in MLS history. Ten games completed in unacceptably ridiculous snowy conditions. So did Robinson or the ‘Caps ask for the game to be stopped? Robinson and his coaching staff certainly didn’t appear dressed for the occasion, and it’s hard to believe they had the right boots with them for such conditions. It can’t have been fun to have been out there playing in it for so long. Caps keeper David Ousted didn’t want to use it as an excuse, and was hesitant to say for sure the game should have been abandoned. “I dunno,” Ousted told us. “Honestly, I said afterwards that that game was more about handling the conditions than it was playing soccer. They did that a lot better than we did. Fredy Montero didn’t start the previous Saturday’s game at home to LA because of a nagging hamstring issue. I’m sure running around in the snow and cold was far from ideal for him. If he went down injured on top of all the other issues, the ‘Caps would be as well firing up the white flag, hopefully not one with blue triangles on it though. Conditions like that could easily have seen a player on either team suffer a season ending injury, and MLS can count themselves very, very lucky that no-one did. Montero didn’t particularly enjoy being out there, and was also firmly in the camp of the game being called off, but feels the team just need to move on from that now and forget about every aspect of it as quickly as possible. “It was different,” Montero said. “I just wish the referee just tried to postpone the game, but he didn’t. It’s not nice to play in those conditions, but the field was for both teams. Unfortunately they scored the first goal and that gave them the motivation to keep going and just play the one way – long balls. Like we said, we’re not blaming the snow for the loss, and there’s certainly a lot of other worrying aspects from the performance that need to be discussed (and we did in our latest podcast), but if MLS wants to be the top world league it strives to be, it needs to do a better job of making sure that their games are played in proper conditions, and respect the wellbeing of their players and fans in the process. 10 snowy games, but has there ever been one called off? Only weather related ones I can recall for us were Canadian Championship matches; one postponed and one abandoned. There were quite a few weather delays, but I don’t recall any of them spilled over the next day. The fact that Robinson is still the manager is the biggest shock. He should and will be fired.